This building is characterized by its interplay between opacity and transparency and between interior and exterior. 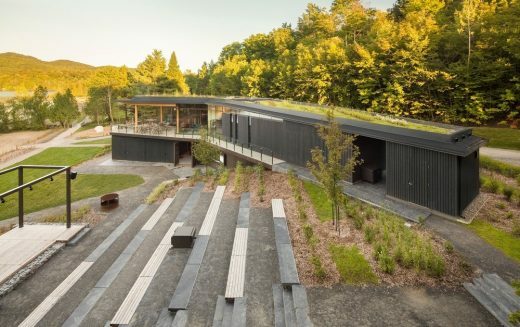 It is very carefully integrated into its setting, following the site’s topography so closely that the building appears to be sculpted from the landscape itself. The mix of materials and colours gives it character, while creating clear boundaries between different spaces. 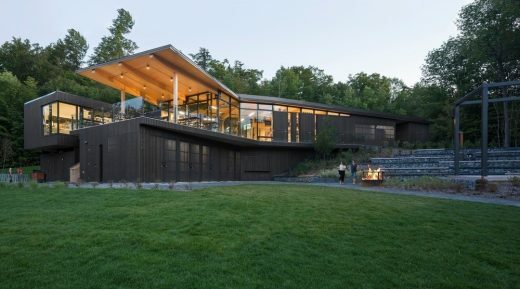 The new building sits in a forest, along a narrow escarpment on Camping Road, with Stukely Lake and its beach below. The first half of the building’s main volume gently follows the same contours from which the outdoor amphitheatre is carved. A stratum of the building’s landscape-roof rises gently, echoing the park’s topography. In the centre, part of the building is open to an expansive view of the lake before taking a sharp change of direction, highlighting the building’s entrance and defying the slope. The building plunges toward the breathtaking view of the island and Mont Chauve. The service (kitchen) area is tucked away discreetly, while the patio and discovery space layer three strata with different geometries. 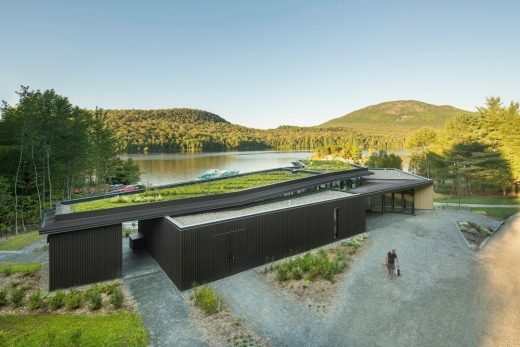 The first, the storage area for sports equipment, has a functional geometry aligned with activities and the lake; the second is the patio, which adjusts to both perimeter and interstitial traffic; and the third is the roof, rising higher to open up the view of Mont Chauve; it is angled upward to better control incoming natural lighting. 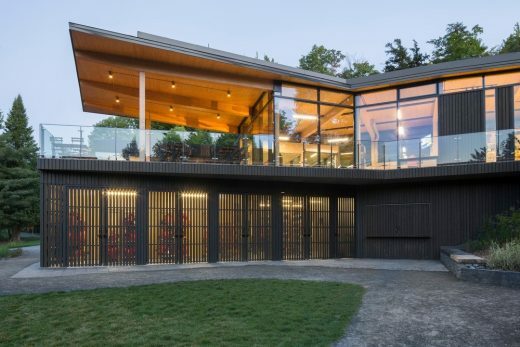 Not unlike a gazebo, the interior and exterior spaces are interconnected by a network of walkways comprising a catwalk, stairs, covered passageway and an outdoor gap based on the natural course of the trails. The park’s lakes, mountains and forests provided inspiration for the choice of materials. The buildings have a symbiotic relationship with the site’s extraordinary landscape and the materials found there. Wood, in various forms, gives both interior and exterior spaces warmth and coziness. It works in harmony with the indigenous vegetation used for landscaping, and with the slate paving stones and gabion walls that characterize the paths and landscaping. 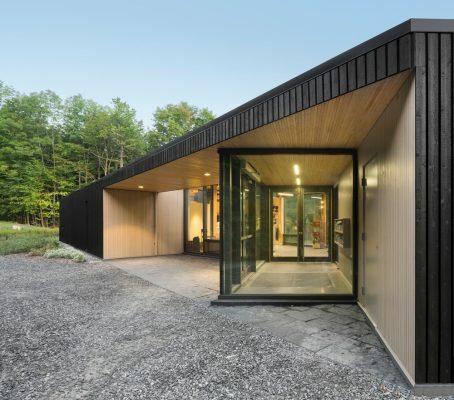 The architectural approach and the site itself dictated the use of vertical cladding echoing tree trunks in the nearby forest. The textures, materials and colours used, in harmony with tree bark, cause the building’s appearance to shift with each passing hour. 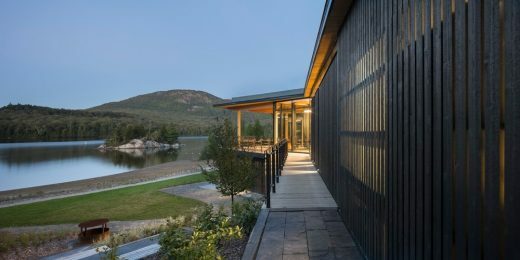 Crafted specifically for this project, the building’s cedar cladding is applied in alternating strips—recessed, in relief, gaps. As a result, the shadows falling on the building change as the sun moves across the sky. After nightfall, the effect transforms the storage areas into gigantic lanterns. 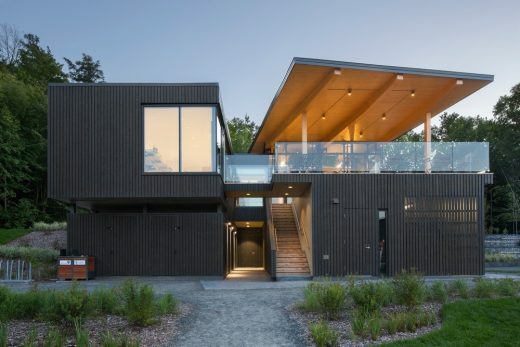 The cedar cladding is also used for rain barriers and ventilated façades in a simple but clever way, by removing or keeping the recessed portion. The building’s organic configuration, in symbiosis with the site, nearby activities and views, demands that the main volumes include certain openings. 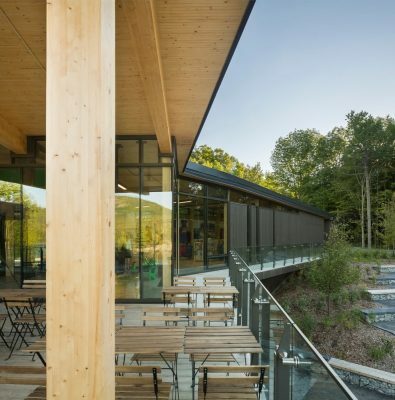 Smoother and paler cedar cladding is used in these locations, evoking the contrast between skin and flesh in freshly cut fruit, enabling a coherent reading of the building. 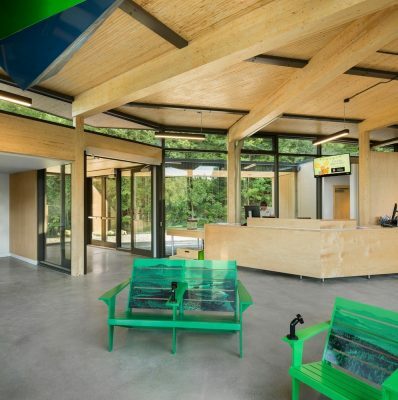 The Centre de Services Le Bonnallie is the first of three buildings to be built by the Anne Carrier architectural firm in Mont Orford Park. 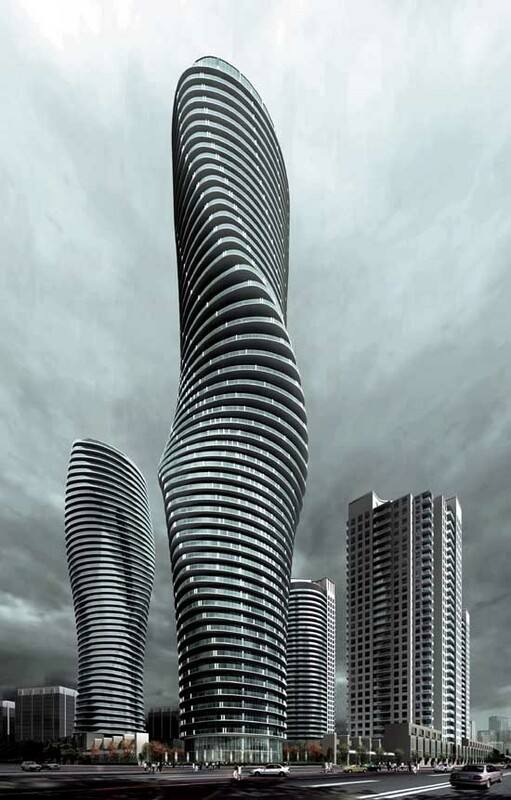 Collectively, the projects will give the park a unique, identity-shaping architectural signature. The continuity of the approach, focused on clear architectural expression, will lead to rich, stimulating places that sustain a constant dialogue with users and the environment, in every season. Structural and civil engineers: Les services exp inc. Winner of the Prix d’excellence Cécobois 2016 for institutional buildings under 1,000 sqm.